While the rest of the world is still enduring the harsh winter weather, the fashion world has turned full bloom looking forward to spring. Once again, floral has popped up as a major trend for this spring season. 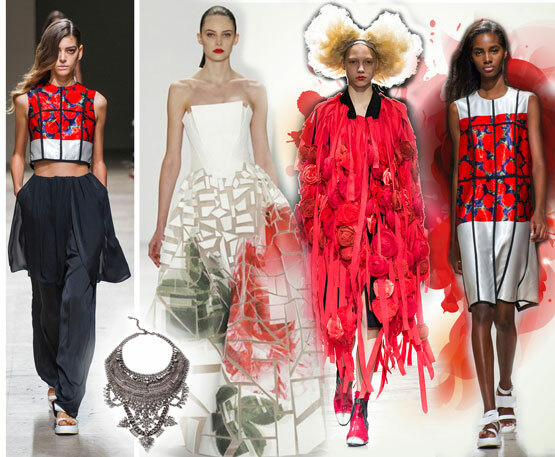 Red will be the “it” color for Spring 2015 and designers can’t seem to get enough of the hue. Roses seem to be of particular interest to designers’ green thumbs for Spring 2015. Carolina Herrera’s collection featured boxy retro shift dresses in a true blue-red hue, while the brand’s ball gowns highlighted red rose prints. Comme des Garcons’ collection for the season showcased nothing but layers of red, from jackets of different textures and fabrics to dresses literally dripping with bouquets of fabric roses. Maison Rabih Kayrouz’s collection boasted a myriad of luscious reds in rose printed crop tops and shift dresses, along with red draped crepe cocktail numbers and even rose printed jackets. This trend is so feminine and classic, it’s sure to be a hit. Pair unexpected jewelry pieces with it to keep your rose prints looking chic. The new jewelry label Dylanlex’s silver rhinestone bib collars are the perfect addition to this trend. Each necklace has a dramatic, almost punk flair while rhinestone accents give them a throwback 1950s feel, making these necklaces the perfect compliment to fashion’s spring bouquet.